"Love is a language spoken by everyone but understood only by the heart." is an inspirational quote that I came across when browsing the internet during lazy Friday evening at the office. At first I thought it was a simple words coined together to come up with a definitive definition of the most controversial word of all time called love. Well, I call it controversial because it has its own definition depending on the feeling and mere existence of LOVE in someone else hypothalamus. I call it controversial because it is too powerful to define someone else's feeling or to bond different personalities as one. Worst it can be one great reason to subjugate two very strong relationship into two. I still remember the first time when I felt this strange feeling. Strange that I myself can never explain. The inspiration it brings and the different sensation brought about by the different delightful sensation from within. It was a magical experience. There was magic in love that turns every dark sides into one magical moments of fountains and fireworks, it was a beautiful experience. I had several of this moment where I consider it as the joyous moments of my life and every time I am in this situation I am always reminded by a Basil Valdez song. Love gives hope to give you the strength to carry on. Love pushes me up in every moment when I am about to give up. But, what if the love you felt is not mutual. 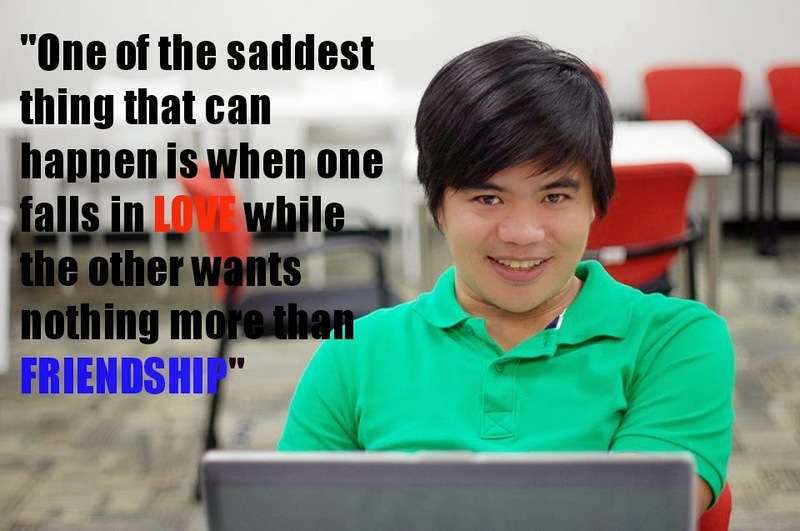 What if the person you cared can only offer friendship? What if he/she cant give the most of what you've been wishing for. Will you ever continue loving that person the same way you did when you are in that magical moment of infatuation. When you are in the moment with no rain but the sky is filled with rainbows and glittering magical clouds. When everything to you is magic. When you are in the moment of day dreaming. Will it shatter every dreams, aspirations and hopes during those "you thought it can work" moments. When you are denying that it can never happen despite sweet noting messages. Will it ever change the someone else's feelings and pursue that once upon a time bed time story when they'd exchange shoe. Will this one-sided love affair be eradicated and removed from everyone's vocabulary and option when a chance to exchange shoe has been done. I came across David Slater's song entitled Exchange of Heart and made me wonder if this will ever happen, will it make a difference? if this happens to you (AN EXCHANGE OF HEART) will you really know why he or she had loved you in the first place and will it make a difference if he/she had known the reason for loving you. If there was no such thing as Exchange of Hearts then should you have wished that you were the one being loved and not the other person. How unfortunate it could get if by any chance the only man/woman you wanted to share this unconditional and magical thing called love happens to be the person you've treated as your best friend. Or what if you would know that your best friend whom you treated as a sibling is unfortunately looks at you differently. Will you reconsider what you feel and love him back more than best friend. It happens sometimes that from best friends but what if you love someone else should you just wished them that they could find the love their suppose to be getting? The desire of someone else's hypothalamic emotional roller coaster between the differentiation of LOVE and FRIENDSHIP is simply too heart breaking, more so, if you are hoping something else should have happened but it simply did not materialized to a desirable outcome. When finally you've come to a point of not surrendering but of course to have that realization of letting go. The reconciliation of one heart shattered into pieces mending it together to be whole. Just give yourself that ONE LAST CRY to finally let go everything. You can only have that one last cry when you've finally learned that the chance is over. That the love youve been wishing for has finally come to an end. That moment when you are no longer hoping.